This entry was posted in In The Studio and tagged nemo, studio by Aria Nadii. Bookmark the permalink. 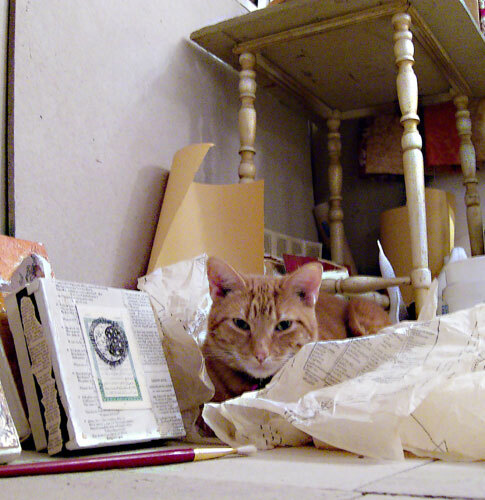 Once Nemo assembled all the supplies for making art, he realized his lack of thumbs was a problem and resorted to telepathy. Is that paint brush getting closer? Hah! You crack me up. This really did make me laugh out loud. I do think my cats want to make art and that icon is the cutest thing ever. You know how I feel about kitty feet. Usually I just crack myself up. Kitty feets…the fuzzy parts between the toes!!!! They are so helpful aren’t they? I want to reach through the internet and pet him. Well. He can’t seem to get enough of that! They’re so very helpful, aren’t they? Especially when they’re pursuing their chosen careers as paperweights. Hah. Yes, and they are always conscientious enough to hold down only what you want to use or are reading. That one was trying to escape or something. Clearly, it is not where it belongs. 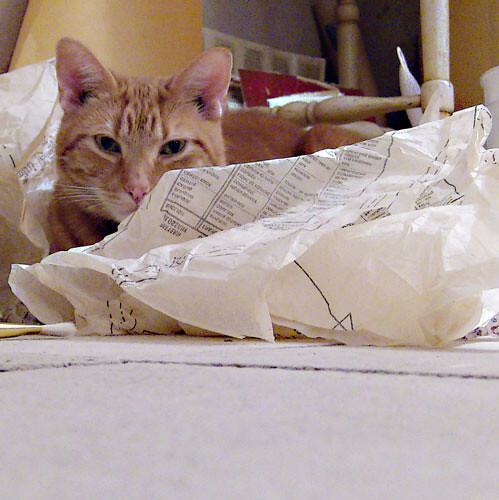 Nemo does have this thing about how everything and everyone goes in a certain place. He will complain loudly if C.P. and I switch seats or use each other’s computers. It drives him crazy. Seriously adorable. I want to pet the kitty! Or at least let the kitty sniff my hand and decide whether I’m a worthy petter. He’s more of a hugging cat. He’d rather skip the petting and go right to the hugging and smooshing. I love that first picture especially. it looks as if you opened a packet expecting fish and chips and found a large cat instead! Funny you should mention golden retrievers. I often remark that Little Nemo reminds me of a gold retriever. We sometimes call him Nemo puppy. He’s like a cross between a large cat and a retriever, which is my favorite kind of dog. Now I am craving fish and chips. Nemo is a lovable guy. He’s in the other room having a conversation with himself. Lovable and odd little guy. One day I have to bring all my cats over for a furry playdate! Nemo would be thrilled. Freya will not play with him and he complains about it loudly.